The story of the forced deportation of nearly two million people in the Balkans and Asia Minor during the 1920s is not well-known outside Greece and Turkey. And yet it was a precursor to the brutal ethnic cleansing policies imposed by various regimes during the later years of the 20th century. Communities of Muslims and Christians were suddenly uprooted from their homes and shipped across the Aegean sea merely because they had the wrong religious beliefs. 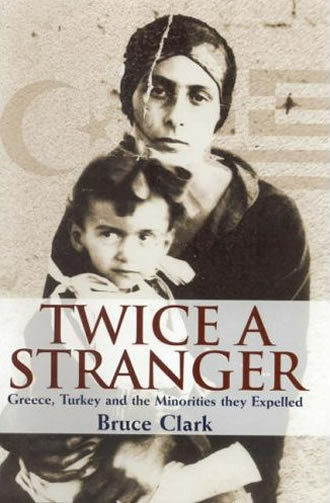 Twice a Stranger is an exceptional book in that it delves into the history of the Greek-Turkish population exchange not solely on the basis of archival research but also through extensive ethnographic research conducted in different parts of modern Greece and Turkey. Bruce Clark offers testimonies from Orthodox Christians who lived in Turkey and from Muslims who lived in Greece. Both were forced to cross the Aegean Sea in 1923 to make their religion match their new national identity, which was under creation both in Greece and in Turkey. Clark’s point of departure - the 1923 Treaty of Lausanne and its aftermath - is a milestone in European history. The sequence of events that led to the Treaty is hardly ever addressed or spoken about both in Turkey or in Greece today. Instead, people on either side of the Aegean are only presented with “convenient truths”, that is, only with what they need to know in order to become “good” (or “better”) Greeks or Turks. The author does not capitulate to this tradition and he tries to detach himself from these familiar “truths”, digging deeper into the lived experiences of those who experienced these events. But is such a strict focus on the Lausanne Treaty justified? The author attempts to strengthen his case by providing what he believes is sufficient material for his readers to make their own assessment. For Clark, the Lausanne Treaty does not stand out as a landmark in European history solely because it became a stepping-stone for subsequent piecemeal solutions for many nation states across the globe, but rather due to the consequences that it bore. In other words, Clark is not so much concerned by the diplomatic and political implications that made the materialisation of the Treaty possible. Instead he is concerned with the deportations that followed and the effects the Treaty had on the lives of nearly two million Greeks and Turks who were dispossessed because they were “of the wrong religion”, as well as on the lives of those who received these refugees in Turkey and Greece. Trying to be objective or to construct a “true” account of past events is probably a fallacy if not a perilous game, which Clark does not seem to be willing to play. But this by no means leads to an account permeated by personal opinions, speculative ideas and neutral views and this is telling of Clark’s skills as story-teller. The author avoids lapsing into inferences which are not well supported or appropriately referenced and he demonstrates a good knowledge on a wide range of issues pertinent to this corner of the Mediterranean. But if this is a book about events relevant to Greek and Turkish recent history, why should anyone else bother to read it? Well, there are many good reasons why the book is appealing to a much wider audience. Clark has tried to show that history can have many readings with many different narratives possible for the same series of events. In addition he offers his book as an in-depth case study of events similar to which we have been witnessing more recently in various parts of the world. In the late 20th century Bosnians, Kosovans, Arabs and Jews, have had, to an extent, experiences that can be regarded as parallel to the ones that Greeks and Turks had 60 to 70 years before. This book is not just about the past and the suffering people may have endured or the hopes they may have had for a better future on the soil where they were born. It is mainly written to shed light on the aftermath of the Lausanne Treaty, which may have come to be seen as natural or unavoidable and a justifiable resolution - at least in the eyes of those involved in its creation - but which can also be examined from an alternative viewpoint. Clark demonstrates that the experiences of those who underwent the consequences of the Treaty may contradict the predictions of those who devised it and how the lived experiences of real people and the high-level political manoeuvring were incommensurable. Lastly, this book offers a revealing account of the machinations of influential individuals in the political, economic, and religious sphere in their pursuit of such large-scale and complex aspirations, such as the creation or consolidation of nation states. This is probably one of most valuable contributions of this account: the shaping of collective consciousness has been a vital tool in modern nation states, and Greece and Turkey could not be exempted. To this end, the principal deployment of religion for the moulding of national identity arises as an open question rather than as a starting point that should not be challenged. Whom is the book for? The author wanted to target the general reader and not exclusively the university scholar. If this is so, then the book has certainly served its purpose. But this is not to say that everyone will enjoy reading it. People longing for the “security” offered by the modern nation states, will find this book unsettling and disturbing. To them, nothing can be as convincing and worthwhile reading as the “official” version of history found in textbooks or recounted by leaders (political, religious etc) on both sides of the Aegean. On the other hand, those who can bear the burden of having their preconceptions unsettled and can allow themselves to mistrust given “truths”, “facts” and dogmas, will find that this book can open up another window in their lives. For if being a stranger involves the “other” and the “us”, the “same” and the “different”, then those who were obliged to move to Turkey or to Greece due to the Lausanne Treaty have twice become strangers. At first, when they were living with people of the “wrong religion” for many decades and for the second time, when they were forced to be artificially accepted by their imagined co-ethnics despite speaking a different language or having a different culture. Clark’s book offers a salutary opportunity to assess the legacy of the Lausanne Treaty in retrospect and that of more recent arrangements that followed its spirit. We can use his research to challenge the reproduction of strangers overall. If there is one shortcoming, it is that it assumes knowledge of the legacy of the Ottoman Empire inherited by many parts of Greece and Turkey in the early 20th century. The empire’s social differentiation, its economic structure and its relevance to the period of history examined could have been unpacked for the reader. This is not to circumscribe the book’s value and relevance; it is rather a hope that prospective attempts to examine the same issue, by the same or another author, will improve these aspects. What they cannot afford to do is not take this book seriously.